Attorney Sanford I. Furman has over 25 years experience in family, bankruptcy, and defense law. Our team has delivered a professional and elegant design as well as helped simplify his websites content. The website easily allows new clients to find him with the Search Engine Optimization that our team has implemented. The site also provides easy navigation for clients and instant submissions for claims. We’ve worked with a variety of lawyers and have exceeded their expectations – especially those who have worked with the large, overpriced ‘lawyer specialists’ on their website before coming to us. 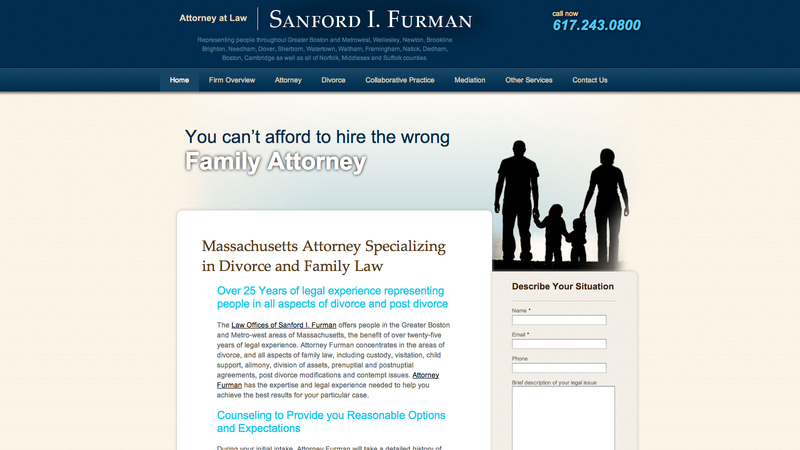 Visit this Wellesley divorce attorney website.